On his first trip to Africa, Secretary of State Rex Tillerson is trying to change the subject — but so far, at least African leaders are not quite ready to turn the page on President Trump's reported derogatory comments about the continent. It's the latest episode of the nation's top diplomat playing clean-up on his boss's comments — including a plug for free trade Thursday, even as Trump prepares new tariffs on steel and aluminum. 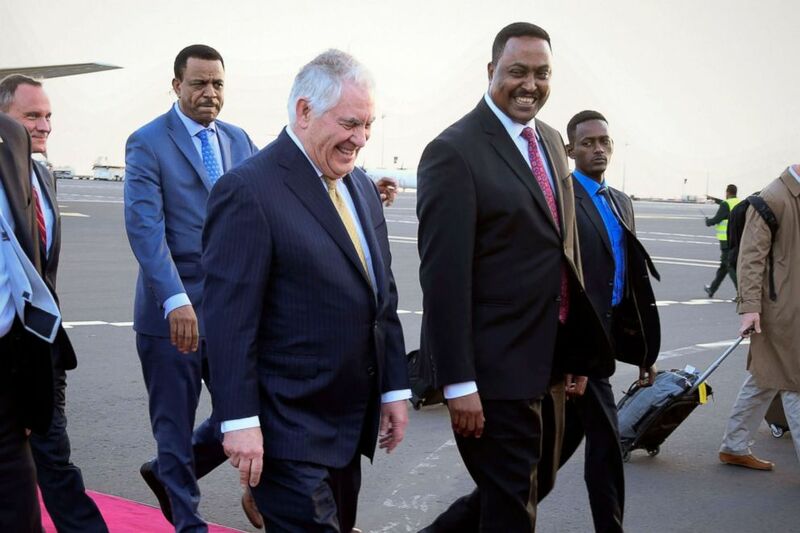 Tillerson landed in the Ethiopian capital Addis Ababa on Wednesday night and met with the country's foreign minister and prime minister, as well as the chair of the African Union, the continent's economic and political union. 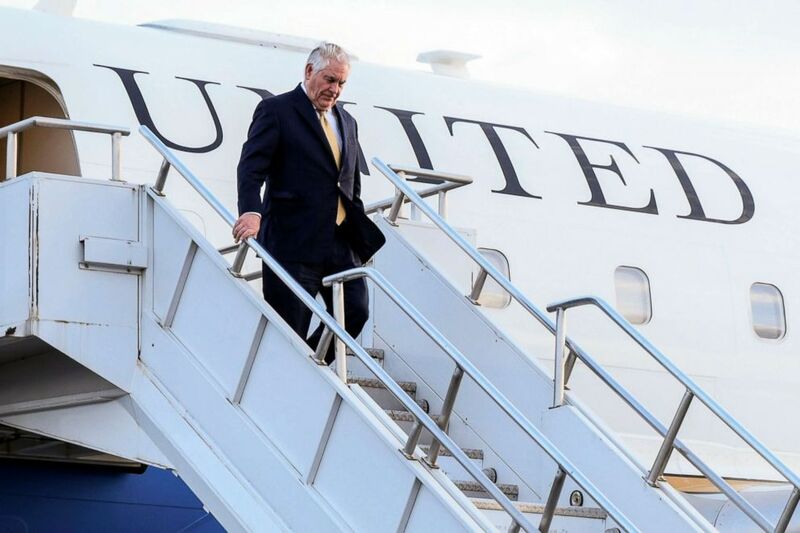 Secretary of State Rex Tillerson disembarks from the plane upon his arrival at the Bole International Airport in Addis Ababa, Ethiopia, March 7, 2018. His trip is the highest-level visit by a Trump administration official, and he has a lot of work to do to push back on the perception that this White House does not care about or have specific policies for Africa — while also promoting U.S. development and investment over Chinese and joint counterterrorism efforts against the expanding threat across Africa. Trump's Oval Office comments have detracted from those efforts. In January, the president reportedly called African nations and Haiti "s---hole countries" in an immigration meeting with senators, asking why the U.S. couldn't attract more people from countries like Norway instead. Trump eventually denied making the comments, but not before they sparked protests and condemnation. The African Union's ambassador in Washington demanded a retraction and an apology "not only to the Africans, but to all people of African descent around the globe." The body also nearly passed a resolution blasting Trump for "promoting racism, xenophobia and bigotry," according to a draft obtained by the Associated Press and Reuters, before tabling it after Trump wrote a letter expressing his respect for Africa. Secretary of State Rex Tillerson (L) smiles as he walks with Ethiopian Foreign Minister Workneh Gebeyehu (R) upon his arrival at the Bole International Airport in Addis Ababa, Ethiopia, March 7, 2018. During a joint press conference with the African Union chairperson Thursday, Tillerson had to address the issue again. "President Donald Trump, we’ve heard, has called Africa a 's---hole,' and Africans. This is something that Africa is still digesting," an Ethiopian journalist told Tillerson, asking whether he agreed or whether Trump owed Africans an apology. "The United States commitment to Africa is quite clear in terms of the importance we place on the relationship," Tillerson responded, referencing Trump's "personal letter to the chairperson, reaffirming the importance of this relationship." For his part, AU Chairperson Moussa Faki of Chad confirmed he had received the letter in January and shared it with other African leaders. "I believe that this incident is of the past," he said, adding of Tillerson, "The evidence of the relations between Africa and the United States is personified through his visit." While Tillerson received some criticism for not visiting Africa in his first year, his trip has generated plenty of anticipation and excitement, two African diplomats in Washington told ABC News. They added that most leaders are ready to move past Trump's comments and onto how they can work with the U.S.
That's still a tougher deal for the Trump administration, given its deep proposed cuts to diplomacy and foreign assistance in Africa while China continues to increase its investments. African Union (AU) Commission Chairman Moussa Faki (L, partially obsured), of Chad bids farewell to Secretary of State Rex Tillerson after their meeting at AU headquarters in Addis Ababa, Ethiopia, March 8, 2018. Trump's latest budget proposal in February slashed spending for Africa by 37%, down $3.1 billion from current levels. Meanwhile, China announced on Monday that it expects to increase its foreign affairs budget by 15% from last year to a total of $9.5 billion — more than doubling what it was five years ago, according to the Financial Times. In addition to that, China has launched its $1 trillion "One Belt, One Road" initiative, with plans to build roads, bridges, ports, and railways throughout Africa and elsewhere. 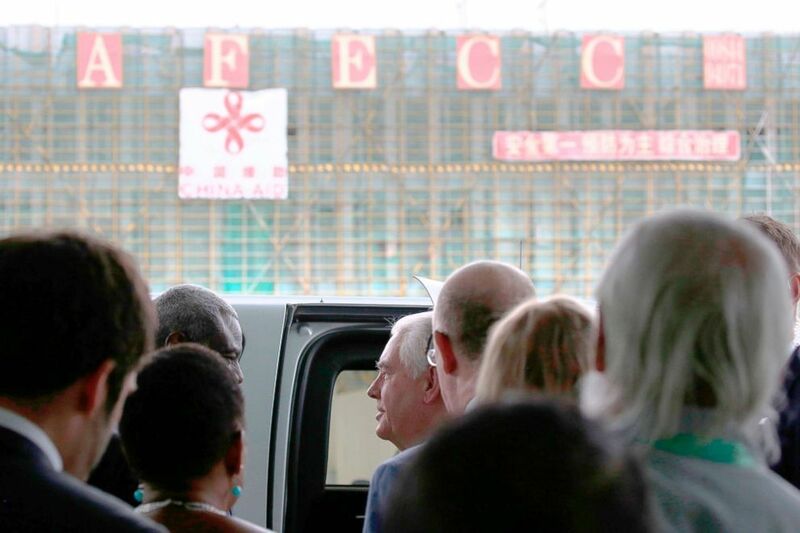 Tillerson said alongside Chairperson Faki that the U.S. wouldn't try to keep "badly needed" Chinese money out of Africa, but encourage African countries to consider the strings that China attaches to its loans, credit, and development. "Our message is for countries to consider carefully what the terms of those agreements are and not forfeit any elements of your sovereignty as you enter into such arrangements with China," he said at the AU headquarters, notably built by China. "We welcome Chinese participation, but we hope they will follow international rules, international norms, and respect the sovereignty of countries and respect the need to develop the citizens of those countries." 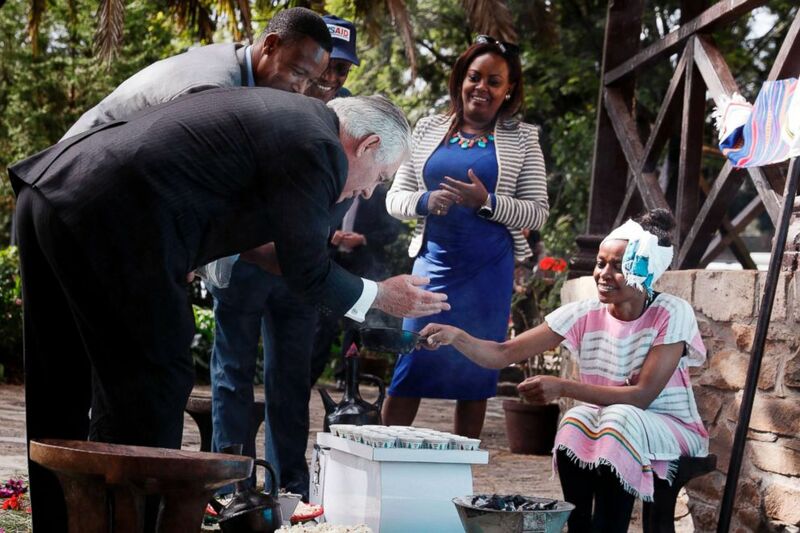 Secretary of State Rex Tillerson wafts the aroma of fire-roasted coffee beans during a traditional coffee ceremony at the U.S. Embassy in Addis Ababa, Ethiopia, March 8, 2018. Later on Thursday, Tillerson added that the U.S. was looking for more opportunities to invest and develop business ties with Africa, provided that African countries continue to implement economic reforms "to lower some of the barriers to investment, create greater certainty to outside business investors, strong rule of law, good regulatory processes." That would bring U.S. businesses in, as would a pending free trade agreement that would lower tariffs and increase trade among African countries, Tillerson said. "Stimulating intra-continental economic activity and trade from countries on the continent is actually going to create even more opportunity for inbound foreign investment and certainly U.S. business interest," he added, even as his boss tweeted about new U.S. tariffs on steel and aluminum.